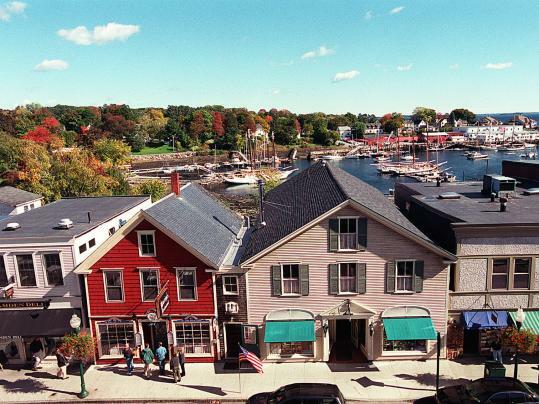 Camden Maine is a popular destination spot for tourist visiting the Maine coast. Camden is a beautiful coastal village located two hours north of Portland, Maine. During the peak summer months finding a hotel with vacancy can be quite difficult. Although Camden does have many overnight options varying in price and accommodation. If you are planning on an extended stay you may want to consider booking your Camden Maine Hotel well in advance. Below we have compiled a list of great hotels for you to look at. For your convenience we have also included contact information to assist you with booking your hotel. The Lord Camden Inn is one of Camden’s Finest Upscale Boutique Hotels. It’s located in the middle of downtown Camden. The Lord Camden Inn has been open to the public for over 30 years and has unsurpassed hospitality, comfort and service to their guests. Conveniently located on Route 1 Main Street Camden, Maine. It’s a large building with bright blue awnings and directly faces Camden Harbor providing great views of the harbor and beautiful sunrises. Theres an abundance of fine dining opportunities within walking distance of the Lord Camden Inn. If you are looking for a laid back family friendly accommodations you will want to take a look at the Country Inn. “You will discover the casual essence of Camden and Rockport Maine.” The Country Inn provides cozy queen suites year round and in the summer months they have 2 queen cottages available. Located on Route 1 between Camden and Rockport Maine Harbors. It’s an ideal location for day trips and outings between both towns. The Country Inn also provides a country style breakfast buffet and late afternoon snacks. In the evenings warm chocolate chip cookies are served to each of their guests to help make them prepare for a relaxing evening stay. Staying at the Grand Harbor Inn is a 4-Diamond luxury, waterfront, and boutique Inn. While staying at the Inn you also get to experience the pristine beauty of Camden Harbor all from the luxurious comfort of the guest waterfront suites. The waterfront boutique inn was recently awarded the AAA Four Diamond Rating a very prestigious award. The Grand Harbor Inn also overlooks the marina giving guests a great view of the yachts and local fishing boats. A vibrant mix of fine dining, and unique shops surround the inn. Each of the guest rooms and suites are exquisitely well appointed with balconies, fireplaces, jacuzzi, rain showers, high definition TV’s, wireless internet, and much more. Internationally renowned and awarded inn and restaurant it’s known for its service and luxurious lodging accommodations. The Camden Harbour Inn is located on a hilltop overlooking a 180 degree view of Camden, Camden Harbor and the surrounding mountains. A serene location for travelers looking to relax and enjoy the surrounding beauty of Camden, Maine. Ledges By The Bay is one of a few local Camden Maine Hotels that overlooks the scenic Penobscot Bay and provides oceanfront access. Four levels of ocean view accommodations are provided. Some of these views off panoramic views of the surrounding bay. Room rates are very reasonable and competitive. The Ledges also offers a 2-bedroom waterview cottages for weekly rentals. Amenities include flat panel TV with cable programming, in-room computer, high-speed cable internet access, WI-FI, telephone. The deluxe waterview rooms offer sliding glass doors with private balconies that overlook Penobscot Bay.